I’m fascinated by fonts that have something to do with honey or bees, and I thought I’d share some of my favorites. The font I used for my logo is the first one I found with the word “Honey” in it. Honey script. If you look closely, the wings of my Bee are also the B from Honey Script, so it’s sort of a double use of this wonderful font. So, I have some qualifications. These are not the only fonts that use the word Honey or Bee, but the ones I’m listing are ones that I really like. I guess there’s no specific criteria, just that there are certain fonts that I like more than others. So, here are a bunch that I like that have the word Honey or Bee in them. For all of the fonts, click on the image of the font name to go to the page where you can purchase or download the font. This is a font that’s free for personal use. I like the nice bold strokes and the compact letter shapes. Click on the image to download the font from Dafont.com. I’ve been fascinated by fonts that have something to do with bees or honey, and I thought I’d share some of my favorites. This font is by a designer who has some very unusual fonts. Many of them are handwritten and have a mixture of capital and lower-case letters. This font is donationware, which means if you want to use it you should send a donation to the font designer. Click on the image to see it and find out how to contact the designer. Honeybee should be at the very top of my list because it has both the word Bee and the word Honey in its name. And I think it’s a cute font, but I wish there were options to have a lower-case o without the heart. Though the @ and Ampersand characters (also hearts) are kind of cute. I like how the capital letters are pretty plain while the lower-case letters have a bit more personality — it makes this font more readable, I think. This is free for personal use and available at Dafont.com. I think Honeycream is my new favorite font. It’s the only font on this list that you can’t get for free (though many of the fonts here are listed as free for personal use, which means that you can’t use them for a business unless you get a business license). But this one is one you have to pay for if you want it, for personal or business use. And it’s only available as part of a bundle with a bunch of fonts and watercolor styles for Photoshop and also some vector clip art. The link attached to the image of the font name takes you to that bundle, because I think that’s the only way you can get this font, and this link is an affiliate link. I bought this bundle, and it’s well worth it, not just for the fonts. 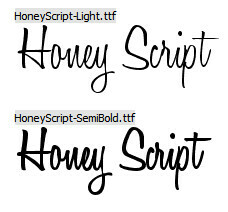 Honey Script is a font I used to use for my logo, Honey Script. Other than the beautiful retro look that this font has, I also like that there are two weights. I love a good light font, but there are times when it’s just too light and you need something darker, thicker, so that it makes enough of a contrast with the background to stand out and be readable. So this one has both options, which is nice. The designer of this font, Dieter Steffmann, has many really great fonts. Some of my favorites are Gabrielle, Marketing Script, Titania, Arabella, and Coaster. 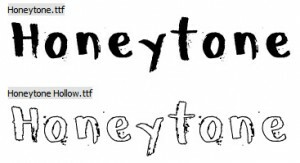 The next font on the list is Honeytone, a font I just discovered recently. It has a rather grungy look, like it was drawn with a marker or brush that was just beginning to run out of ink or paint. And this font comes in an outline version also, which is somewhat unusual for a grungy font. This font’s designer also has many other nice fonts, including a sort of sketched-looking Denne Milk Tea, and another of my personal favorites, Laser Metal. These are free for personal use. The next one, Sugar Honey Iced Tea, is by the same designer as Glazed Honey Buns, above. These are both donation ware, and there is a link where you can donate to the author on the page where you download the font. Again, this is a charming mixture of capital and lower-case letters, as are many of the fonts by this designer, who specializes in unusual handwritten fonts. The last one, Wild Honey, is another 100% free font. I just had to include it because of the image the designer included on the page where you download the font. It’s a beautiful depiction of the font styled so that it looks like honey dribbled onto a cookie. I want to find a Photoshop style that does that. The ones I have make it too yellow or two orange, but this one is just right. I hope you’ve enjoyed looking at these great fonts. Did I miss one? If you know of another one that has something to do with bees or honey, mention it in the comments below.